Rebranding 101: I Don't Like What I'm Doing Anymore. There comes a point in life when a woman (or a man) is sick of their... hair. For the past 13 years, I've consistently chopped off my own hair in an effort to feel different. These 'chopping' sessions usually come after a loooong nap (that I wasn't supposed to have). I'll wake up, look at my clock, feel disgusted with my laziness, hop out of bed and start cutting my hair in the bathroom. Afterwards, I'll always feel like I'm someone new. Maybe it's more symbolic than practical, but it was a relief to DO SOMETHING that lets me start fresh. I didn't like who I was at the time (lazy, procrastinating, messy) -- so I changed something. Which brings us to... Rebranding! Rebranding is the act of changing something in your brand. There's so many Whys that can lead you to rebranding yourself or your business. "I don't want to do this anymore. It's not fun." "This isn't the future that I imagined." "I'm boring. I want to be different." "I've grown. This thing is not the me right now." Sometimes you know exactly what you want to change. Like your blog name. You just click edit, type in a new one, and save! Sometimes you just feel dissatisfied with something, but you're not sure what it is. You just know that your blog, or passion or business doesn't excite you anymore. When this happens, rebranding is always an option. Rebranding kinda feels like an all-out thing, but it doesn't have to be! 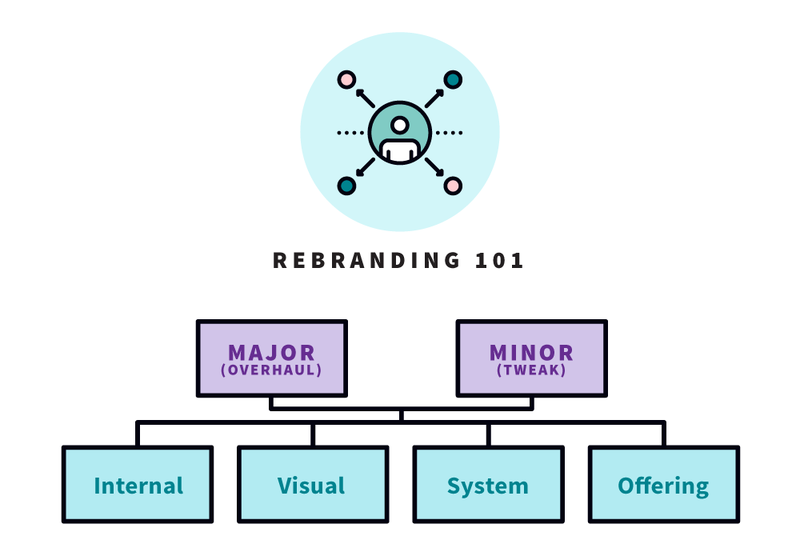 I always like to divide rebranding into two categories: MAJOR (overhaul) or MINOR (tweak). An overhaul is when your brand becomes almost unrecognizable from what it used to be, or a total makeover. A tweak is a minor change that doesn't change your brand at its core. + Internal branding: The insides of your brand. Like the words you use to describe your brand, the goals you have, how you want to bring value to people's lives. + Visual branding: What your brand looks like. Like your logo, sublogos, blog header, brand colours. + System: What you do to get things done. Like how you respond to customers complaints, your receipts and invoices. + Offering: What you offer to make money. Like your product and service, how you package them. In the coming weeks, I plan to delve more into what you can overhaul or tweak under each aspect. Let me know which part of rebranding you'd most be interested in!